Rebecca Cook was a Margaret Bridgman Scholar in Fiction at the 2009 Bread Loaf Writers’ Conference. She has published poetry and prose in many literary journals, and has twice been nominated for the Pushcart Prize. Rebecca contributed to All That Glitters, a nonfiction collection edited by Corey Ginsberg, Nicholas Garnett, and M.J. Fievre. After a VIP sale at Lip Service, one of the most popular literary events in Miami, the book was released online last fall (along with Issue 7 of Sliver of Stone Magazine). In October, we had a reading at Books & Books, in Coral Gables. In November, we were be at the Miami Book Fair International for a reading followed by a Q&A with the prose editors. Following is an interview with Rebecca. MJ: In your story, Romance, you made the daring choice of using the 2nd person POV. What led to that decision? RC: I wrote this piece when I was getting my MFA from VERMONT COLLEGE and in the essays that ended up in my collection, SQUEEZE, many of the essays are in 2nd person. I LOVE 2nd person. It has an intimacy, a closeness. Or course, this is exactly what some people dislike about it. And I also love present tense, the immediacy of it—lots of writers and editors also dislike it. MJ: I’m curious about your writing process. Would you guide us through the steps this piece went through? RC: I wrote this piece pretty much the way I write all pieces—I hear the first line and then I write it down and the rest of the piece follows. But this piece was a little different because SQUEEZE was a thesis, so did plan to write a lot of the pieces. I do remember that this piece was very easy to write. I am still very close to it. RC: The Terrible Baby is a family story, a girl’s story of sadness and neglect. But it’s also a story of love, the complications of family—you love them, but they almost always hurt you in some way. Some of the poems have been translated into Romanian and my translator asked me about the title. The title came from a poem with the same title, and I truly felt that there was a terrible baby inside me, in my chest, throwing fits and dragging me down. I didn’t at all think of the “terrible twos” but it fits perfectly. I only realized this when I explained it to her. MJ: Did you go through an MFA? If so, what did you like/dislike about your education. If not, how does one become such a fine writer? RC: I did get an MFA (Vermont College of Fine Arts) and I did enjoy it. But the decision to get the degree—I hoped that it would help my career. And it may, eventually. I concentrated on both CNF and poetry. I don’t think I learned anything from studying poetry at Vermont. Not a thing. I don’t think I’m meant to “study poetry,” at least not in that setting. I write poems. I have always written poems, but I shouldn’t have studied poetry. If I had it to do over again, I would just concentrate on CNF, which I very much enjoyed and learned lots and lots. I understand prose craft very well, but poetry is a mystery to me. RC: Well, now I’m writing poems—inside a kind of madness actually. I am bipolar and have had a very difficult 18 months—deeply depressed, but then came the hypomania/mania. There have been a couple of times when I literally couldn’t stop writing. It was almost painful. But a book is coming together rather quickly and these poems, unlike the poems in my forthcoming book, I Will Not Give Over, are very, very precious to me, which may be a very bad thing. I hate rejection and criticism and just now I don’t want any on these new poems. But I have started submitting them. Two have already been picked up—“The Omega” appeared in Georgia Review this summer, and “Microcosm” will appear in Antioch Review this fall. 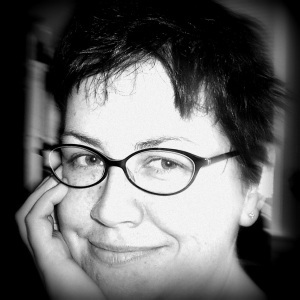 Rebecca Cook‘s recent work has appeared, or is forthcoming, in Southeast Review, Grist, Pank, Plume, JMWW, Stone Highway Review, The Cortland Review, 2nd and Church, Mayday Magazine, and Bitter Oleander. Poems in translation have appeared in the Romanian literary magazine Convorbiri Literare. Her chapbook of poems, The Terrible Baby, is available from Dancing Girl Press. She blogs at godlikepoet.com.